Join Zach on his journey of building his custom log and timber home. See the process and share his experiences along the way. Follow this video series to see the building process from design to manufacturing, breaking ground, building, and finishing this amazing home. How Much Does Zach's Home Cost To Build? This is the floor plan that Zach started with. Zach made several modifications to this plan. In Episode 2 you will see the final plans. [00:00:00] Zach: You don't get this opportunity much in life, to be able to have such a hands-on approach. And that is what makes it special to build your own home. That's why it's so great to be doing what we're doing. [00:00:13] Narrator: On this episode of, "Building My Dream Home", Zach begins his journey towards building his custom, one of a kind home. We'll take you behind the scenes of Golden Eagle Log and Timber Homes and show you how the building process begins. Join us as this picturesque lot is transformed from dream to reality. 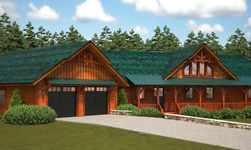 [00:00:45] Narrator: It's a crisp, fall day in central Wisconsin and at Golden Eagle Log and Timber Homes, it's business as usual, as custom homes are being designed, engineered and manufactured. [00:01:05] Narrator: A family owned business since the very beginning, Walter and Marlace Parmeter got their start in 1966, first as a building supply company. Then in 1986 the business expanded into a one stop custom log and timber home manufacturer. Today, the second generation continues to run the company with brothers Jay and Tod at the helm. It's been a part of their lives since childhood. [00:01:30] Tod: He had me driving the forklift by age probably 11 to where I could go out and unload a semi, bringing in some lumber. I was already helping some of our customers out in the lumber yard side of things. [00:01:42] Jay: You know here we are 13 year old and 10 year old kids waiting on customers. So, it worked but some of the customers didn't believe us. [00:01:49] Narrator: With over 5,000 homes sold since 1966, family remains an integral part of the business. [00:01:56] Jay: We’re actually talking to the fourth generation. He's three years old and he really likes forklifts. He does draw some house plans with me too. So, he's a maybe the fourth generation. [00:02:05] Speaker 5: What is this? [00:02:07] Jay: This is the deck. [00:02:09] Speaker 5: But how’s it going to set down though? [00:02:11] Jay: Oh, it’ll set down just fine. What’s on the wall, tongue and groove? [00:02:14] Speaker 5: Tongue and groove I think. [00:02:16] Jay: Tongue and groove or half log? [00:02:18] Speaker 5: Half log. [00:02:22] Narrator: While Golden Eagle sells around 100 homes per year, one in particular is in the very early stages of development. A home that is inspired by its family heritage. [00:02:33] Zach: My name is Zach Parmeter and I'm part of the third generation here at Golden Eagle Log and Timber Homes. My sisters and I, my cousins we've been working here since we were little kids. We pretty much grew up here and it's always been just a natural part of us. [00:02:46] Narrator: Instilled in him from a young age, Zach has more than his share design ideas. Now, it's time to build something for himself. [00:02:54] Zach: For me, it is so much about the detail being done just the absolute best way. I mean that is-- that gives me goosebumps and that is what makes it special to build your own home. That's what makes it so cool to do this whole process that it makes it all worthwhile. And that's why you're building a new home, you're not living in someone else's home. And you get the chance to do it the perfect way for you. It's not going to be perfect for someone else, but it can be perfect for you. And that is what’s really cool, that's why it's so great to be doing what we're doing. [00:03:32] Zach: Now, one of the very first steps is to figure out how much you can spend. So that's why you have to go to the bank. The appraiser is going to tell you how much they're willing to loan you and you're going to have that figure. [00:03:42] Zach: And then you need to make the decision, well, how much do I actually want to spend? [00:03:46] Zach: Once you know what you want to spend, then we need to start filling in the puzzle pieces: how much is your land going to cost?, how much do you plan to spend on the actual house itself as well as any amenities? Now, in my case, I've already had the land for a few years. So, I already had that part of the equation all figured out. I have a beautiful five acre wooded lot and I think it'll look perfect for a log and timber home. I had a pretty general idea that I wanted about a 2,000 square foot ranch style home. I knew I wanted two to three bedrooms on the first floor. I always figured I'd finish off the basement in the future. I knew that with these Wisconsin winters, I'd want an attached garage, that was important to me. [00:04:28] Narrator: Golden Eagle’s Clearwater floor plan was selected as a starting point for Zach's home. [00:04:33] Zach: Everything about this plan seems pretty spot on, but there were some tweaks I wanted to make. I mean it's a good starting point and all of our customers are doing that, they're always customizing it just for themselves. So once I had a general idea on what I was going to build, then I can get that floor plan to builders. And they would tell me you know what they would probably charge for something like that. We don’t have contracts yet, nothing set in stone. 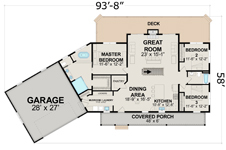 I don't even have the floor plan fully figured out; there's still things I want to change. But it helped me get a sense on this is where price is probably going to come in at. 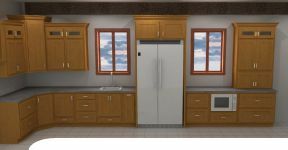 And that was really helpful for me because then I was able to enter the design process with an idea on where can I make changes to the house and still stay within budget? [00:05:27] Zach: The design process is really fun because this is when you start to really visualize how the home is going to sit on your land, how you’re going to use that land and where you're going to clear the trees and excavate. I actually went out there, and I ribboned off where my driveway will be and I got an idea for okay well this house this would sit perfectly here and I’m actually going to orient it a little bit more this way and that way I get more natural-- I get the morning sun flowing through the house and I get the evening sun also coming through the house. It's all about facing the windows the right direction. A lot of our customers actually do that and I see why they do. [00:06:10] Zach: Now that have everything marked off, we’ll be able to tell the excavator where to clear the trees, then we get going on things once the snow melts. It's really fun to be out there doing that. And it helps you make decisions on maybe you need to move where the garage was going to be so that you get a better view or add more glass to a certain wall. [00:06:44] Zach: What I'm doing here is I'm actually filling out the driveway approach permit. This is so that I have an address for my build site location. This way, we can have deliveries sent there and they actually know where they're going. So, it's kind of cool, you start to see it some more concrete things become reality here. What we're looking at here is from this point to this point is 260 feet. So, that's right here. We’re actually looking at it from this perspective, so that's 260 feet. My driveway itself will be 14 feet. And then from this distance to this will be 33 feet. It was really easy for me, I already had a natural clearing in the tree line, really made the decision making pretty easy on that. [00:07:28] Zach: My next step is to meet with the excavator to walk the land to get an idea on okay, these are the trees I’m going to clear out. I wanted to clear about forty feet around the house. I mean really you want room for the builder to be able to work, you need to be able to set material somewhere. I’ve had plenty of customers that are building in mountains or are on narrow lake lots, they don't quite get that luxury and they just work around it. But, you know that's important and that was important for my builder to know that he would have that flexibility. [00:07:58] Narrator: With summer on the horizon, and the snow long gone, it's time for the trees to be cleared from the lot. [00:08:14] Zach: It was so cool to finally see some trees getting cleared. It was amazing, it's already happening. You spend so much time thinking about it and planning and then all of sudden you start to see some action. Oh, it's just unbelievable. [00:08:28] Narrator: Zach is one step closer to living in his dream home. Subscribe and follow along as this log and timber home becomes reality. [00:00:00] Zach: Today will be a really fun day in the office. And I know that because this is the part that our clients love the most. They love customizing their own floor plan and that's exactly what I'm doing for myself. And if you're anything like me, you've been on Pinterest, you've watched H.G.T.V. You see a lot of really great ideas out there. And this is when you start to apply them to your own home and that's what I'm doing today. So I look forward to showing you what I have in mind. I knew from the start that I wanted timbers in my house. I like the square look of exposed beams and that made it really easy for me to choose Golden Eagle's custom timber package. I wanted drywall because it gives me the ability to paint and change my wall color, if I ever want to. And the drywall will balance out the heavy wood trim and the wood planking on the ceilings as well as all the wood floors throughout the home. [00:00:50] Narrator: With the Clearwater floor plan as his starting point, Zach begins the process of customizing his home, beginning with the exterior. [00:00:58] Zach: First thing that's important to me when I'm thinking about this house is I want it to be a timber home. So, I need to add some trusses in here. What I see here is a 10/12 roof pitch. Think I'll make that a 12/12 and that'll give me a little bit more clearance, it'll push that truss up higher in the great room area. And then, I just like the idea of a simple truss. And then, what would really compliment that well and tie it all together is just to do some arch brackets on these posts. It's actually a real simple addition but it sure does bring everything together. I suppose the way I picture everyone coming up to the house is they're going to see this truss up here but they also see what's happening in this gable. So, we might as well have another truss but if I move that up to a 10/12 roof pitch I should be able to easily fit a truss in here, a beautiful truss. Now, I think it's a shame that we have a wall here without any windows in it. I want as many windows as possible in this house. So, I think it'd be great to have a window right in the bathroom, that'll bring in a lot of light. And then what I would do to that window is I'd make sure that it has obscured glass in it, that way no one can actually see through it. And then there are bedrooms here. So, we might as well have two large windows. [00:02:22] Zach: Now, one thing that I'll have to give some consideration is this garage. Although I really like the idea of keeping it more simple like this a little bit more unassuming. I don't really know how I feel about the idea of snow going off that garage roof and landing in my driveway. So I probably have to take a look at the cost implication of changing my gable the opposite way. Let's see if I take a gable, if I go up here, and then we do another truss here. I like that a lot. [00:03:02] Zach: Whenever you have a gable, you need to think to yourself what do you want up on that finish? What do you want to actually be on the wall of the gable? So, I'll probably look into a vertical 1" x 12" cedar board on board, that might look really cool. Probably do some big strong 12"x 12" corners there, running vertical also on each side of the house. Not only will that save me money but it also makes sense when it comes to a timber frame home. When you think about timber frame home, you think of straight edges and square edges. That vertical 12" x 12" corner, that'll look really good. If I could do some sort of an eyebrow roof or little overhang here. I really like the idea of two 8 foot wide doors. That way it doesn't look like a garage. I want to actually look like a house, an extension of the house. [00:04:05] Narrator: Moving to the interior, Zach places a mud room in between the garage and the entryway. Within the mud room, he adds an area for his dogs, complete with a doggie door with access to the outside. Now he begins customizing the laundry and pantry room. [00:04:20] Zach: We have a lot of space to work with here. Everyone talks about having a large pantry, a nice walk-in closet. I can see where, I could probably make that pantry a little smaller and add in a half bath right there. The reason I think of a half bath is, I grew up with my grandpa, he's always showing me his new floor plans and the thing he always says, he always wants a bathroom right by the entry. Because he says, "You come home from grocery shopping you want to be able to set your groceries down right away and then go to the bathroom." So, that's always on my mind when I'm designing floor plans. He wouldn't want to have to go across the house to this bathroom over there. So, I'll look into that, we'll see if maybe a half bath is a possibility there. I don't see why it wouldn't be. The one thing I am hesitant about with this laundry room area is it's all open. If I could do some sort of a barn door here that would slide back and forth to kind of dull the noise in that area there might be some possibilities there. I'm about ready to get these revisions to design and these timber trusses here, those I'll have design figure out where those should be really located but I'd probably match the same profile that I'm doing on the outside of the home there. 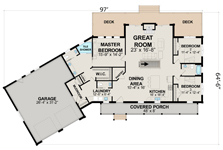 I'm really liking the overall layout of this plan. I can see why it's one of the most popular ones. I'm excited get this to design and get the revisions back, that way we can work out a little bit more. [00:05:53] Narrator: With Zach's changes now on paper, the engineering department gets to work implementing the revisions. They also meet with Zach's local building inspector to verify local building codes that are specific to his building area. [00:06:04] Chris: All the engineering is done site specific. So, we take that all into consideration. Where other log and timber companies typically engineer to where their home facility is and then it's the customer's responsibility to meet the requirement of their local municipality. Every home that we build for a customer here is a custom home. We may start with a model that interests the customer but it's really just a starting point. [00:06:31] Narrator: After some clever work by the engineering department, Zach is presented with an opportunity to maximize his living space. [00:06:37] Tim: Since we have all the vaulted ceilings in here, we have an option to add some plank shelves in this area here. Between these two bedrooms is vaulting up and we have basically this dead space right here in the bathroom. So, what we could do is we could frame that in with some timbers, and go over that with some decking, 2"x decking to give them more of that rustic feel. And then on top of that we would have a wall up above, that would still keep the room separated. Then also in the master bedroom, we can also do the same thing as to put a storage/plank shelf area over this area also, because we got about 6 ft. depth here. And we could do that same principle up there too, where there would be wall along here with the plank shelf. But then behind that we could frame this in there and it'll be almost like a hidden storage area for you. [00:07:19] Zach: I like that. Could we not even have a wall here and just make this all loft area? [00:07:23] Tim: Yes. We could. We could make that a loft area also. [00:07:26] Zach: So when I'm down here, in the master bedroom area I can look up and basically see a loft area. [00:07:32] Zach: A smaller version of a loft. [00:07:35] Zach: And then probably do some sort of ladder to get up there. Something custom. [00:07:39] Tim: Yes, we could. [00:07:40] Zach: Awesome. Awesome. I like that. [00:07:41] Tim: Over the garage, what we do as well, an example here is we go with a what we call a storage truss. What that'll do, that gives you a little extra space for storage. It's not too expensive and also, it's just like cold storage, where you put some stuff up there like your camping gear. We have the roof space is there for this house and then it just gives a little simple way to put some stuff in there for you. [00:08:01] Zach: One of our engineers Tim, discovered some great opportunities for my floor plan. I'm really excited about that storage truss above the garage, that'll give me a lot of extra space. But you know it's the bedroom areas, that extra loft space you know that would have been unutilized before. And now, it's really going to add to the mystique of the home. It's going to look great when you look up there. So, I'd say, we're really close to heading into final engineering. Things are looking really good. Before I sign off on my plans, there's one last thing I want to do and that is to take it to my grandparents' house. They both founded Golden Eagle and I think they'll be really excited to see what I have to show them. [00:08:38] Zach: So what do you guys think of the plan? [00:08:40] Walter: Well, I think it's fantastic. [00:08:42] Marlace: I agree. It is very, very, very nice. [00:08:46] Marlace: I can't see much I'd change on it. No hallways to speak of and it's great. Yeah, I like it. [00:08:55] Zach: Thanks. It feels good to have your approval. [00:08:57] Marlace: And it's got a lot of room. [00:09:01] Narrator: Zach is another step closer to living in his dream home. Follow along on the next episode as he picks out kitchen cabinets, doors, vanities and the rest of his interior. [00:00:00] Narrator: They say creative thinking inspires ideas. That the smallest details can make the biggest difference. The design is not just what it looks and feels like, but how it works. On this episode of "Building My Dream Home", we'll follow Zach as he puts the final touches on the interior of his home. [00:00:25] Zach: With my floor plan nearly complete, I'm now ready to focus on the interior details. Today, I'll be heading over to my showroom to pick out my kitchen cabinetry, my bathroom vanities, the faucets as well as the interior doors. All of this will be done with the help of one of our interior design experts, Derrick Schultz. [00:00:42] Derrick: The nice thing about building a new home is you have the ability to start with a clean slate. And we're going to be able to incorporate many different accessories into your cabinets. Things that are extremely popular right now are large, two drawer base cabinets for storing pots and pans, plate storage. Also incorporating roll-out trays. There would be trays inside that you could pull out that are full extension so they're going to come all the entire depth of the cabinet. And then also when you close them, they have the ability to be soft close as well. So, anything that you would store on there, whether it be mixing bowls, things of that nature when you slam it shut, it's not like they're going to rattle or shake. And then cutlery dividers, storage for your utensils near your range top are definitely something that we can look at incorporating as well. [00:01:25] Zach: One of the key features I'd like to include in the kitchen layout is incorporating a beautiful range hood. And I'm thinking of wrapping that with some stone around there. Stone that would also match the fireplace chase on the other side of the home. [00:01:37] Derrick: Well, first of all, tying your fireplace and your stone up together is going to be beautiful way for those two areas to complement each other. That's something that we can really make stand out, can be a 'wow' factor. [00:01:47] Zach: It's important to me to keep clean lines. I think that's defining with the timber style that I'm going for with my house, but I do want to make sure to incorporate natural wood in these cabinets, not necessarily a painted finish on everything. I do like the idea of that island accenting the rest of this cabinetry. And I also want to make sure to incorporate lighting underneath the wall cabinets. I think that will light up that surface area real nicely. [00:02:11] Derrick: Pulling in a rustic theme into your timber frame home, I think would be a good option. So, I think we should take a look at the rustic woods that we have available. That would be a good place for us to start. 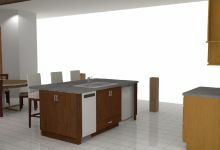 And then, once we have the perimeter cabinets figured out, let's take a look at your island and we'll figure out something that complements the rest of the kitchen. Through Golden Eagle, we have 26 different wood species that come standard. As well as any other wood species that you can imagine. What's most popular for our customers is going to be the rustic wood species but we also have the more standard, traditional wood species as well that don't show the knots. One thing that you have to take into consideration is a rustic wood species refers to the natural characteristics of the wood. So, any of the knot structure or grain pattern within the door. [00:02:57] Derrick: We also have the ability to distress your doors, which is manmade characteristics such as dings and dents or worn edges. So those are all things we're going to have to take into consideration for each room in your home. [00:03:08] Narrator: After choosing the cabinets, they move on to selecting the interior doors. [00:03:12] Zach: Until today, I'd never even considered that my interior doors would actually match my kitchen cabinetry. To have the same color stain, wood species and markings on those doors, that's something that I think will be a nice continuation throughout the home. It should tie everything in very nicely. [00:03:30] Derrick: This cabinet here shows us a tiered cutlery divider. So, you've got two different levels of areas where you can store spatulas or whether it be knives and forks, things of that nature. This would be good near a prep area as well. Another option that we're going to have for our base corner cabinets storage will be the Super Susan cabinet. These rotating trays being that they're resting on these fixed items allow you to store more weight on them than you would in the standard Lazy Susan cabinet. Alright Zach, so now this display here shows us some other different features and options that we have available to incorporate into your kitchen. One of them being the soft close doors that we discussed earlier. It is going to be standard for your kitchen, also soft close, solid wood dovetail construction drawers, full extension soft close standard. This display also shows us a different installation method for your kitchen sink. This has an apron sink versus your more traditional drop-in or undermount sink. Also plate racks and open storage that can be nice focal points and features if you're interested in any of these items as well. [00:04:33] Zach: Being able to utilize the showroom to actually open up the displays allowed me to envision myself in my kitchen. I'm able to actually make a conscious decision, a very well-educated decision on what will work well for me, how do I like to use my kitchen? [00:04:47] Narrator: Zach and Derrick now discuss the kitchen island, the bathroom vanities, countertop and sink options as well as the faucets. [00:04:54] Derrick: Now, a couple things to take into consideration above and beyond just the style of the faucets, is the fact that all of these are contractor grade faucets. There's ceramic valves in the fittings and things of that nature. These are not the same faucets that you can purchase at a box store. For the most part all of the finishes are interchangeable based on the styles. So, for example, if you really fell in love with this Dryden series faucet, we can get it in Venetian bronze for you instead of the champagne bronze that it's currently shown in. [00:05:22] Narrator: With Zach's plan to heat the floor in his master bathroom and utilize a barrier free shower entry, Derrick shows Zach another clever idea to further customize the space. [00:05:32] Derrick: Similar to the options that we had in your flooring, having those heated, we also have that same option available for your shelving in your home. The advantages to heating your shelving would be to give yourself warm towels when you jump out of the shower to wrap yourself in, once you step out. [00:05:47] Narrator: Next, they discuss the laundry room and ways to improve the functionality of it. [00:05:52] Derrick: So, one thing that I looked at when reviewing your laundry area is that we had two different work areas. And what I mean by that is you had two different countertops sections. One of them for your sink, and then another one for possibly your folding area. 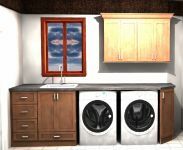 One thing you may consider is increasing the heights of your cabinets to allow for one continuous countertop to run over the top of your washer and dryer. [00:06:12] Zach: It's easy to recognize that you should have great cabinetry design in your kitchens and in your bathrooms, but I think it's sometimes overlooked what you can really do in a laundry room area. And changes that Derrick made with increasing the base cabinet, allowing me to have a countertop from wall to wall, I mean, that is going to transform that space. And it's that attention to detail that I think is going to make this home feel just even more custom for me. [00:06:38] Narrator: With Zach's wish list complete, Derrick has everything he needs to design the custom interior of Zach's dreams. [00:06:46] Derrick: So many people don't truly understand what a house is going to look like when it's on a floor plan. 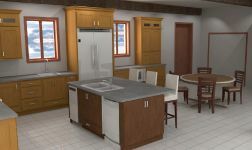 Until they have the opportunity to come in and us show them the 3D renderings of their home and see the cabinets up on the walls that type of thing, it really helps the customers take ownership of their house. It's amazing listening to what their experience is like and how much they enjoy it. 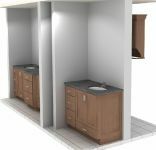 [00:07:10] Zach: Derrick has sent me over the 3D renderings for all the cabinetry design that we did the other day and I can finally visualize myself in the space. I can actually see it, having everything in color here, actually being able to see these images, it really helps paint the full picture. All we have left is to pick out the exterior finishes for the home. [00:07:30] Narrator: Join us on the next episode as Zach picks out the exterior accents of his home including the windows, stone, stain colors, log and timber options and more. [00:00:02] Zach: It's a lot of fun picking out what goes on the exterior of the home. When I think of my home or really any of these homes that we that we help people build. I think of a WOW factor. [00:00:16] Narrator: With the interior of his floor plan finalized. Zack's last step is to select the exterior design elements and finishes. Today, Zach will be meeting with Derek Schultz design expert at Golden Eagle Log and Timber homes. They'll start the process with the windows as they discuss the options and features available in Golden Eagles custom timber package. [00:00:36] Zach: When selecting my windows. My top consideration was I want as much glass as possible. So, for me I didn't have to worry about privacy. I'm in the middle of a wooded Lot. I don't have any neighbors. And I also wanted as much natural light as possible. And then the other consideration I had is, I want to make sure that what I choose for my colors as well as the style and it blends well with what I'm looking to do with the rest of the home. [00:01:00] Derrick: This particular unit is a double hung unit. Which means that both sashes, the bottom sash as well as the top sash are operational. The advantages to this are that you are able to clean this unit by simply pulling these tabs in and cleaning like that. We are also able to do that to the top sash. So especially for areas of your home that aren't gonna be easily accessible from ground levels you don't wanna get out a ladder. A double hung unit is definitely a good option for you there these. Encompass vinyl units also have options as far as grills. The window grills for this unit are between the glass so you don't have to worry about cleaning those separately. One other advantage to this Pella Encompass Vinyl unit is that it is maintenance-free. It's not going to require any additional maintenance on the exterior or the interior of the home years down the road. [00:01:48] Derrick: This particular Pella unit has an aluminum clad exterior with a wood interior that I'll be showing you shortly. This also has an argon filled glass as well as UV coating similar to the encompass unit that I'd showed you earlier. One of the advantages to this particular unit is that it's a casement unit which happens to be our most energy efficient unit available. The reason being anytime wind were to blow on this unit it actually helps close the unit tighter than what like a double hung unit would possibly do. [00:02:19] Derrick: There's approximately thirty different colors available for the exterior of your home. As well as different color options available once we get to the inside. First off addressing the hardware there's going to be eight different colors available for you to choose from on the hardware. As well as four different wood species available for the interior of the window. [00:02:19] Derrick: Another advantage of these Pella units is that we have the ability to put accessories between the glass which helps reduce allergens. This particular unit shows shades which are able to be installed from the top down. Or they could be installed at the bottom and moved up which would allow for additional privacy in bathrooms or bedrooms for example. Other advantages to these windows is this retractable roll screen here. When it comes time to cleaning these windows you'll simply be able to roll the screen away unlock the unit which actually sets both locks. Once it's open you'll be able to clean the glass from the inside of your home on the exterior as well as the interior. [00:03:21] Derrick: To make your life easier. We're able to offer several different pre finish colors on the interior of your windows, your tongue groove, and the interior doors which will all match. [00:03:31] Zach: There are so many options it's really a lot of fun and it really can accent a home very well. [00:03:36] Narrator: Next they'll head outside to discuss different design options for the exterior of the home. [00:03:41] Derrick: We've got this board on board cedar here running vertically. This is certainly a good option to run up in your gables to bring a different architectural element into the home. It shows our hand-hewn texture on the vertical corner that we have here. All of this is a nice way to bring in different colors on your home. [00:04:01] Derrick: Bringing in the architectural element of cultured stone on the lower portion of your home is also a nice way to not only help reduce maintenance, but bringing that additional texture that we're looking for. When it comes to designing your home. [00:04:13] Derrick: Different architectural elements that we show on this are going to be the rustic channel vertical cedar that we have up in the gable. Which also has that band board providing that transition between your gable finish and the wood soffit. What's very common is for customers to use the aluminum soffit where this would soften really brings in a whole other option for you to bring some color into the home. Then also, instead of using steel fascia. We've got a stepped wood fascia that is just stained and looks nice and compliments the logs really well. Also the decorative truss that we have there. It's nice to set that off with a darker accent stain as opposed to the lighter stain that we're showing on that vertical channel it really helps differentiate that rustic element in your home. [00:04:59] Zach: I decided to use our 12 inch double hewn half log. And I just think it's so cool. We're the only ones that offer it. It goes up to 12 inches tall. And it's got the rough hand-hewn finish on it. It looks really rugged and really strong. And then to complement that, I actually want the really big vertical corners. Now I could have chosen any corner style that we offer. But I decided to stick with the vertical corners because it's simple, its elegant, and I think it really pairs well with the timber frame style. [00:05:27] Narrator: With his log shape size and texture chosen. Zach now selects his stain and caulk color. He then chooses a cultured stone to match. As well as shingles that complement the rest of the home. Lastly, he chooses a maintenance-free soffit and facia. [00:05:42] Zach: It was really easy to pick out all the exterior finishes. Derek helped guide me through the showroom. Which was very helpful because first of all I don't have to go around to all these different stores and and compare different samples and colors and finishes. But, also it made things more efficient. We were able to collaborate on ideas. Now that all the exterior and interior finishes are selected we can get everything manufactured and ordered. [00:06:05] Narrator: Now that his floor plan is complete. They're ready for the next phase- construction. Follow along in the next episode as Zack breaks ground on his custom Golden Eagle Log and Timber home. [00:00:02] Narrator: After months of planning and countless hours dreaming of it. Construction is now underway on Zach's custom Golden Eagle Log and Timber home. [00:00:12] Zach: It's a very exciting time in the process. You start to see a lot of movement quickly. It's just ah, it's an overwhelming sense of excitement. It's hard to stop thinking about it. [00:00:23] Narrator: It's day one. And the excavator has arrived on site. And the crew begins digging into the soft sandy soil. [00:00:31] Zach: We have made a lot of progress out here. First of all, we cleared off the topsoil. The Topsail has a lot of rich nutrients in there, a lot of organic matter. So we piled that over here to the side. That is what we'll put down before we ever put the lawn in in the future. It's also important to keep in mind that if I were building in the summertime. The water would naturally drain into the sand. It's very sandy around here. But it's gonna be a winter build. And with it being a winter build the ground will freeze. So we want to make sure to grade everything away from the house so we don't get big puddles out by the construction site. What you can see is we've dug for a nine foot basement here. And it all looks really good. And tomorrow we'll be doing the footings. [00:01:10] Narrator: Before the footings can be poured. The crew stakes in the perimeter of the foundation and all of the load-bearing walls. Footings are poured pads that distribute the weight of the walls above it. And they prevent the home from sinking or shifting into the ground. [00:01:39] Narrator: The aluminum forms where the concrete will be poured are now built on top of the footings. The forms will be removed once the concrete cures. They also frame in the large egress windows. Next the forms are filled with concrete. And the foundation walls are now complete. [00:02:05] Zach: When a lot of us think of basements. We often think of utilities as well as areas for storage. But in today's homes. We're able to incorporate a lot of natural light. That allows us to finish off this space and make it feel like a continuation of the rest of the home. [00:02:19] Narrator: With the forms now removed. The crew back fills the exterior using the dirt they used when they first dug out the foundation. Now they're ready for the next phase of construction. [00:02:30] Zach: Today we're working on one of my favorite features the home and that is the in-floor heat. We are laying all the tubing in the floor here in the basement. And eventually there will be tubing in the garage also. All this will run off the same boiler. So once it's all covered up you won't be able to see it. But you'll definitely able to feel it. It was really cool to see how they laid it all out. Everything is intentional, it has a reason. There's not going to be a cold spot in that floor. [00:02:55] Narrator: Meanwhile back at Golden Eagle Log and Timber Homes headquarters. Shipment number one is already being prepared for delivery. While some companies send the entire house in one shipment. Builders prefer Golden Eagle's staggered shipping system. That only send the materials needed in each phase of construction. This process doesn't overwhelm the job site. Or exposed finished materials to the elements outside for months on end. [00:03:22] Zach: Today is a big day at the jobsite. We are receiving the first delivery. So we left the Golden Eagle shipping Department know what we needed here to build the floor system. So we've got the floor trusses and the floor sheeting. And all that is getting unloaded right now. As you can see, we've got plenty of room around here to unload the truck. So that's really nice. And we only have what we need. I'm looking forward to seeing all the progress. It should only take a few days to get this floor system built. [00:03:57] Zach: What I like about floor trusses is that you're able to span a large area. And you're also able to utilize these large cavities throughout the floor truss. You can use these for your HVAC, your plumbing, or your electrical. And it makes it real easy for those subcontractors. You're also able to get better efficiency out of things like your HVAC because you could have more straight runs. It's easier on your furnace and your air conditioner and all of those systems. [00:04:19] Narrator: Because Golden Eagle designs and provides a complete package. They engineer the floor system to account for heavy items. Such as the fireplace, granite countertops, hot tubs, and quarry tile. Homeowners won't have to worry that their floor will dip, sag, or fail in the future. [00:04:51] Narrator: Golden Eagle also takes into account Zach's zero barrier walk-in shower. By lowering the subfloor for proper drainage. [00:05:14] Narrator: Today the home will undergo a massive transformation. As the exterior walls will be framed and tipped up. [00:05:33] Narrator: The front and rear feature walls have been framed up using two by eight construction. Which allows for better strength and rigidity. The larger space within the wall also means more insulation can be added. Next they continue framing up the exterior and begin the interior walls. [00:06:00] Narrator: Lastly OSB wall sheathing is added. [00:06:19] Zach: Now that the walls are up. I can really start to see the house taking shape. But the thing is on my mind is. Let's get everything covered in case winter comes early. [00:06:29] Narrator: Which started out as an idea is now a tangible reality. Zach's dream home is well underway. And on the next episode. We'll continue the journey as the roof system, porch, windows, and more are added to the home. [00:00:00] Zach: The last couple of weeks have really surprised me. It’s just amazing how much progress can be made. We have a floor system, a wall system and now we're ready to actually get the roof trusses up. Today, we'll be using engineered roof trusses to build the roof system. This is just one of over 50 different profiles that we have here on the job site. What's nice about that is these are already pre-built. That means they'll be able to be assembled and installed very quickly. The builders don't have to build anything on site. Additionally, what's really nice is, I am in the heart of Wisconsin, and we get pretty cold winters here. So, all these were engineered to handle the heavy snow loads. [00:00:40] Narrator: Golden Eagle engineers each home specifically to meet or exceed the local building code. So, whether it's an earthquake zone, hurricane or heavy snow load area, every home including the roof system, is designed for your area. In addition, Golden Eagle has created a high performance energy truss. Conventional trusses have a cold spot where no insulation can be added but with Golden Eagle’s energy truss, insulation can be added over the top of the wall. A draft stop is also added which allows for a well ventilated yet draft free attic. Next, the crew begins building the roof overhang. Zach has chosen the stepped Craftsman style overhang. This not only adds style to the home, but also protects it from the elements with its generous three and four foot overhangs. With the roof framing complete, the crew starts to add roof sheathing. Today, another delivery has been made. As the shingles, house wrap and more have arrived on site. The crew applies the weather resistant house wrap to keep the home warm and dry. Meanwhile, the roofing crew begins the work up top. They start applying the ice and water underlayment. Golden Eagle provides this waterproof shield which prevents damage caused by ice dams and heavy rain. It is generously applied to the eaves and valleys of the roof. Next, they add a layer of recycled synthetic roof liner, which is 25 times stronger than traditional roof felt. The concrete crew has arrived on site and they begin pouring inside the garage and basement. The tubing for the heated garage and basement floors will now be covered. Once the concrete cures, they will connect the tubing to the boiler. [00:03:28] Zach: Today we're installing the boiler. The boiler is going to heat the in floor heat in my basement, as well as in the garage. It will also heat the hot water that runs through the home and then it's also heating the air exchange. So, the forced air that goes through the home, that air is also being heated up by that boiler. [00:03:46] Narrator: The house is now ready for the next step, the covered porch. Like the roof system, the porch is also designed to withstand heavy snow loads. To finish off the deck, Golden Eagle supplies are treated, custom hand-hewn trim board, to match the half long texture on the rest of the house. [00:04:16] Zach: Now, the cover porch has many similarities to the overhangs that are above the garage doors, as well as on the backside of the garage. See these overhangs have beautiful timber rafters supporting them. And I've got 2” x 6” decking that I want to put above it. And that 2” x 6” decking then would support a metal roof. And that metal roof is then going to accent off of the shingles. [00:04:43] Narrator: In addition to the eaves and valleys, all low sloped roofs are covered 100 % and waterproofed. The steel roof will be added later. Inside the garage, the crew is busy assembly Zack's unique three section tall garage doors. With its triple layer steel construction, these insulated doors provide an incredible R-value of 13. Zach doors also feature Wi-fi connectivity, so he can control it anywhere from his phone. Inside the basement, the crew is framing up the utility room. Zach plans to someday finish off the basement and has added a secondary staircase for easy access directly from the garage. [00:05:23] Zach: At the bottom of this stair, we have a nice landing down here. That way, if you're bringing in a sheet of plywood, or some drywall, it's not problem we don't have any issue with headroom or anything like that. We also have the future bathroom plumbed out. So, I already have a general layout of what I'm thinking for the future bathroom, and it's important that since we have concrete work in here, that we already have the drain figured. So, we've got a drain area figured for a future shower as well as the future toilet and then for a future sink. [00:05:57] Narrator: The next day, the maintenance-free windows will install. To complement the Craftsman style of his house, Zach chose to have grids installed in the windows, along with the brown exterior to match the stain. [00:06:44] Zach: What's really nice about these window wells is they're allowing a lot of natural light into the basement. Pairing that with a high, nine foot ceilings, it really feels spacious down here. It feels like a continuation of what's upstairs. [00:06:57] Narrator: The windows have been framed in with massive 4” thick by 12” wide hand hewed trim. Decorative custom timber brackets are added to the covered porch and the railings will be added later. The home's exterior is ready for the next step, applying the 12” tall, double-hewn half log, timber trusses, cedar shingles and more. Subscribe and follow along as Zach's dream home becomes reality. [00:00:23] Zach: It's a lot of fun to choose what materials you're going to use on the home. Here I chose our 12" double hewn, I just think it's awesome. We've got that rough, rugged finish that comes with the hewing process. We also have a 12" stack height here. So it's going to blend in really well with a large timber trusses. Another thing I really like about the double hewn that makes it completely unique to Golden Eagle is the roundness that you get here with the edges. So I'm really excited to see how this looks on the home. I think it's going to be absolutely incredible. Usually our customers order a complete turnkey home including the staining, but I wanted to save some money and that's why I'm doing it myself. [00:01:02] Narrator: All of Zach's custom timber trusses are completed and are now ready for sanding and staining. [00:01:15] Zach: A person can customize this however they want. We can have different ends down here. So I actually specified for it to look exactly as you see it, there's no truss that is going to be built exactly the same. These are all custom made here at Golden Eagle. That's what I really like about it, it's all one of a kind. [00:01:37] Chris: Here at Golden Eagle Log and Timber Homes, we're nationwide manufacturer of log and timber home packages. We service the lower 48, Alaska and Canada. We control the entire process of log and timber milling. We also control the harvesting of the material. Our best-selling species are eastern white pine, western red cedar and Douglas fir. Our FSC-certified foresters go out and cut down a round tree. And then we take it in and have it sawn into a square cant. Then we bring those to our yard. They typically contain about 70-75% moisture content, and then we'll air dry them for up to about nine months. And that moisture content drops to about 30, 35%, at which time we'll put the cants into our kiln and we'll mechanically dry that wood down to 19%, which is the same moisture content that conventional frame lumber has. So you're not going to see any more settling in a kiln dried log or timber home than you would see in a conventionally frame home. So once the log and timbers have been dried, we take them and run them through our profiling mill. Each log is milled to exacting specifications, identical to the one that was milled prior to it and identical to the one that will be milled after it. So, when the logs or timbers are stacked at the job site, there's no guesswork on how the components are going to fit together. [00:02:56] Tod: On the end of this run, this is where we track these. We put this steel gauge on these logs as they come through to make sure nothing's changed in the machine and everything is true. [00:03:09] Zach: You know, one of our internal quality control processes is when we create our corners. We take every fifth corner that's made off of the assembly line and we mock up in our factory the exact corner that we're making to make sure that all of our tolerance is still in check and that none of the stops in the machine may have bumped or moved during the milling process. [00:03:31] Tod: So a full log went in and two pieces of half log came out as a corner set. And this is how much waste we had on that one right there. So it's really thought out, so we're not wasting wood. [00:03:43] Narrator: Zach's pre-finished, hand hewn log and timber trusses are now ready for delivery. Before applying the half log, the crew begins installing the maintenance-free aluminum soffit in facia. They also install the massive 12" vertical corners. Next, they begin the first row of half logs. Zach chose cedar accent shingles for the gable. Next, the first truss will be lifted and secured into the front gable. The first exterior timber truss is installed with more to come on both the outside and inside of the home. A custom rafter roof system on each side of the garage is also completed. This not only adds style to the garage, but also protects the doors and windows from rain and snow. The steel roof is added to the front porch. [00:06:21] Zach: When you come off the driveway, the timber trusses really catch your attention, that's an Arch Queen Truss up there. And behind it is a 1" x 12" board-on-board with a hewn finish. I think it really makes a more distinctive gable, it separates it from the first nine, first 10 feet of the home. It gives it that stunning appearance that I was looking for. [00:06:40] Narrator: The next day, the crew builds the railing system on the covered porch complete with a custom double top rail. It's hand hewn finish matches the rest of the home. On the back of the house they begin building a massive 52' wide deck. Golden Eagle has designed the wood burning fireplace chase to be inside the home, where it will be more energy efficient. By doing so, heat won't be lost outside because the chase has insulation behind it. Traditional fireplaces with a chase on the outside are prone to losing massive amounts of heat since there's no insulation on the fireplace itself. Zach still wanted to the look of a chimney chase on the outside, so the builders fabricate a false chase which will give his feature wall more depth and dimension. The next day, they trim in the windows and patio doors and then apply cedar shingles to the wall. Over the course of just a few months Zach's custom timber ranch Golden Eagle log and timber home has been transformed from dream to reality and the work inside is about to begin. [00:00:00] Narrator: With the exterior of the home nearly complete, the focus now turns to the interior. Zach is building a custom timber home. And he was able to choose the look he wanted for both the exterior and interior finishes. On the interior, he will have drywall with an Old-World stucco texture. To balance out all of the drywall, the home will feature wooden timber frame accents as well as wood floors and ceilings. The work inside is underway as the subcontractors are roughing in the HVAC and plumbing. Next, they begin hanging drywall. [00:01:08] Zach: There's been a lot of progress out at the house. We have insulation in all the ceilings and the walls. And as you can see, the drywall is all up. The ceiling is insulated to an R-62, there's an R-19 batt in there, and then below that is an R-38 batt. Now, what you currently don't see is there will be a half inch foil faced foam board that goes on the top of that and that will all be taped off. [00:01:29] Narrator: Golden Eagle offers both structural insulated panels known as SIP panels or a super insulated parallel chord truss roof system. Zach chose the super insulated system with an R-62 insulation factor. [00:01:41] Zach: We're almost done with all the insulation in the ceiling here. What you see up here is actually a two by six spread out, that's what will attach the trusses to. So, we've actually got a four by four block in between the engineered roof trusses. So really all we have left to do is just finish off that foil face down there. And then add the ceiling finishes and the timber trusses, we'll have a complete ceiling before you know it. [00:02:03] Narrator: Behind the dry wall, they seal every nook and cranny with 1” closed cell foam with an R value of seven. This keeps the wind and bugs out. In addition, blown in fiberglass with R-23 is added. [00:02:17] Zach: I really like the way these timber rafters look on the ceiling up here. It has really come together even better than I ever imagined. And it looks really good with all the natural light flowing from the wall here. When I think of a comfortable home, I often think of a quiet home. So, if someone is getting ready in the morning, they're taking a shower and listening to music, I want to be prepared for that. That's why we have actually noise barrier insulation in all the bathroom walls, as well as all the bedroom walls. Think it will help create a more comfortable, quieter home. If you remember during the design process, I had imagined up this whole kid's loft area. It's really cool to see it come together. There'll be a railing going this whole way so that'll protect anyone from falling down. And then there'll be an access ladder for someone to get up that way. I think one of the most fun parts is the door that connects the two loft from one side to the other. [00:03:10] Narrator: The master bedroom also features a loft with a rafter style ceiling. [00:03:15] Zach: Something I consider when designing this home is I want to efficiently use all the square footage that I can. Now, I don't need a walk-in closet with 20 ft. ceilings. So, I decided to do is I capped off that walk in closet down there and now we have a reading loft up here. I think it's really great. I have now doubled the practicality of that square footage. [00:03:35] Narrator: The next day the crew begins installing the fireplace. [00:03:43] Zach: A key element to any home like this is having a wood burning fireplace. So, what we're working on today is installing this 45” wood burning unit. It gets up to 95,000 BTUs. That is great for a big area like this. We have a large open concept with the kitchen, the dining room, as well as the great room here. So, this will certainly heat that whole area. It'll look really great. We're going to have also a face plate over the top of this. And then the rest the hearth will be finished off with cultured stone. [00:04:12] Narrator: After the dry wall has been taped, mudded and sanded, the custom drywall finishing begins. [00:04:22] Zach: Curtis is putting on a heavy skip trowel right now. This is a look that I always wanted when it came to the drywall. I think it pairs really well with the timbers. I like the Old World style of it. So each wall is unique. We're not just spray in the side. I think that that customization is really going to shine through what the home is finished. So I think we're off to a really good start. Today we're installing all the ceiling finish. This is a one by eight, it is rustic. And what makes it so rustic is the random nail marks in here, as well as you can see where it was hit by the planar. And then just take a look at this knot structure, very unique. You'll be seeing this on all the ceiling finishes. I think that'll balance really well with all the drywall that goes throughout the home. [00:05:06] Narrator: Golden Eagle offers unlimited choices for the ceiling finish including popular options like shiplap, circle sawn, reclaimed and barnwood. Zach chose carved, nickel spaced one by eight. With the ceiling complete, the masons install a scratch coat on the fireplace chase. Next, they individually apply each stone. Meanwhile the crew is about to install the first of three hand- hewn timber trusses. 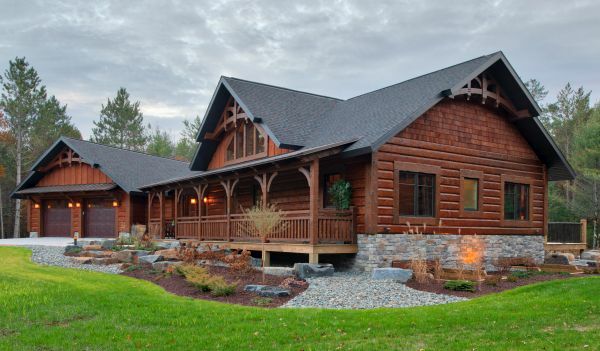 Golden Eagle offers both structural and nonstructural timber frame homes. Zach chose nonstructural with timber frame components, as it would look the same and save money. With this option, Zach has the flexibility to add timber frame components like trusses wherever he chooses. [00:06:52] Zach: There's definitely a wow factor when you walk in. That truss looks absolutely incredible. The stone on that chase over there, really catches your attention. I think it ties everything together, those are larger stone and when you've got bigger beams like this, I think if it all really fits together very well. So first impression, it's even better than I ever could have imagined. One of the decisions was to choose between a real stone or a veneer stone. And what I ultimately decided to do was to save myself some money, probably around twenty grand and go with the veneer product. This is cast from real stone and it's only a quarter of the weight. That probably saves me around twenty grand on the whole project. And considering that it looks like the real thing, I think it was a really good decision. [00:07:35] Narrator: Zach chose to install a perimeter of heavy timber accents used along the ceiling and doors. Next, they install 8' tall interior doors. The doors are trimmed in with matching hand-hewn timber. [00:08:23] Zach: The reading loft in the master bedroom is really coming together. The rafters look awesome, tying into this ridge beam up here. The one thing that is left is an industrial looking railing that's going to go along this loft edge. That will be the same railing that we'll have the other two bedrooms. [00:08:40] Narrator: With the house nearing completion, join us on the next episode as the crew adds finishing details to the kitchen, bathrooms, floors and more. [00:00:00] Narrator: Construction on Zach's dream home is nearing completion and the last thing to do is add the finishing touches, beginning with the tile. [00:00:36] Zach: Here we are in bathroom number two, this is a little bit of a smaller space, so I wanted to make sure to have a nice accent in here. That's why I chose a herringbone pattern. It also offers a really nice balance with all the drywall in this room. [00:00:47] Narrator: In the shower they use a traditional running bond pattern for the tile. They install larger sized tile for the bigger rooms in the home, including the laundry, mudroom drop zone and master bath and closet. Next, they prepare the walk-in shower for tile. [00:01:05] Zach: One of the big features of the master bathroom is this big walk-in shower. Now, what I like about it is that there's nothing to step over when you get into it. So, to do this, we've actually dropped the floor. Then we've got this system in place where it pitches a quarter of an inch for every foot. [00:01:59] Narrator: Meanwhile, the crew begins installing the pre-finished hand scraped hickory wood floors. Golden Eagle designed the hearthstone to sit neatly above the wood flooring to ensure a more finished, clean fit. With the flooring complete, they finish installing the trim and baseboards. [00:02:25] Zach: I really like the look of the worn edge on this trim. It gives it more of a rustic and reclaimed look. Looks like that's what has been weathered for many years and it has a little bit more of an oversized nature, you really get a sense for that when you look at the baseboard here. It's approximately about eight inches tall and even the baseboard makes a statement. [00:02:43] Narrator: Next, they begin building the custom staircase. Golden Eagle has many options for the stairs and Zach chose square treads and rails to match the rest of the home. With the staircase complete, they build the custom double-top railing system. The next day, a shipment of cabinets and vanities arrive on site. 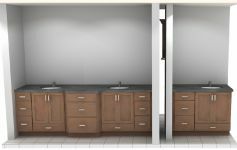 Golden Eagle not only supplies cabinets for the kitchen and bath, but also closet and mudroom cabinetry. The crew uses Golden Eagle's detailed renderings and plans for easy installation. [00:04:21] Zach: We're at the point in the kitchen where all we need are the countertops, the tile backsplash and finishing the range hood. So, what we have here is we've actually engineered this in a way where it will be able to hold all the stone going all the way up. It should make a really good accent in this kitchen area. [00:04:36] Narrator: Next, they installed the Corian kitchen countertops. They use a seam setter to draw the countertop slabs together. Once finished, the seams are virtually invisible. Meanwhile they install the stone on the range hood. [00:05:01] Zach: One of the finishing touches is the countertops. These here have a thick edge profile I think that's very fitting for this style of home. Tomorrow we'll be able to finish off with a tile backsplash that will cover this whole area and continue throughout the perimeter of the kitchen. [00:05:28] Narrator: The countertops feature a built in raised cove for the tile to sit on top of. This prevents any water from getting behind the tile and countertop. The next day, the appliances are delivered. Golden Eagle's design department worked closely with the appliance supplier to ensure a perfect fit not only for the kitchen, but also the laundry appliances. Outside, the stone work is almost finished as they complete the fireplace chase and foundation finish. With the house complete, the focus shifts to the yard as the hardscaping begins. [00:06:54] Dan: We have a lot of natural, native materials. We try and bring in large boulders, trying to make it look as natural as we can. Really just making it look like this home fit the space like we've built a home on top of all these boulders and in the midst of all these plants. And so, the theme would be like natural, inviting and then ultimately distinctive, just like the home. So, we started out in the front, we have a unique area right by the door, we decided to make that a French drain. So, it's actually utilized, all the water goes and collects there and drains out in the ground. We couldn't really put the plants there because of this so we start with this large black specimen boulder that Zach literally walked over the pile and picked out and we put up there and stood it up and made it more like a monument. I think that kind of set the tone for, 'look at this boulder and then just wait for the other 85, going around this house.' And as much as we can try and make it look like nature. [00:09:28] Narrator: Join us on the final episode as we give you a complete walk through of the home. Subscribe now to follow along. [00:00:00] Hey guys! The time is here and the house is done. I'd like to show you around come on in. As we come in we are in this beautiful foyer area. We're greeted with a lot of natural lights and you can see the big timber trusses right above us. I really like this whole open concept because there's so much beautiful stuff in this house you can actually appreciate from pretty much anywhere. [00:00:33] One of the first things that you see right when you walk in are the double barn doors, looks absolutely beautiful. We have this really massive header above there that has a really nice arch top, just the craftsmanship is extraordinary right? When you walk in, right above us we have this big 12 by 12 beam. In fact when you look throughout the whole great room area you can see that 12 by 12 spanning the whole perimeter. And that's the most timber trusses come down on. So right as you walk in, we have this dining room area. So one side of the dining room is a butler's pantry. What I like about the butler's pantry is it has these eight- foot-tall double swing doors. They go either direction, really massive hinges on here. Those hinges I think just look very appropriate with the house. It's the style in a lot of these details that I really appreciate and even matches the door hardware that you see on all the cabinetry throughout the home. [00:01:33] And as we head into the kitchen we can see a continuation of the same exact style, the same door style as well as wood species. But on the island I decided to go with an accent. What I also did with the island that's a little bit different is that a flush toe kick. It gives it more of a furniture appearance. Now in the toe kick on the perimeter here I've got a recess toe kick and that allowed me to do the under-cabinet lighting. 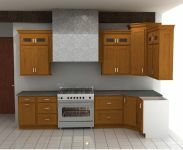 In fact you'll see under cabinet lighting also on the wall cabinets and above those wall cabinets. [00:02:01] This is one of the meal staging areas in the kitchen. It's nice, it's out of the hot zone, so you don't have a lot of action over here. This helps prepare for dinner and then what you also see over here is a second kitchen sink. Someone can be cutting up veggies over here and another one can be prepping over here. I really like this Wolf induction oven here; what I really like about the induction top is that very easy for me to clean. And also let's say you're boiling water, you can boil water twice as fast, you can cook everything very evenly. And there's also plenty of room on both sides of the countertop here to set any hot dishes or any of your prep food. [00:02:38] Speaking of countertops, the solid surface top, look how thick that is there and this nice radius on the top. This top over here is a quartz slab and it looks absolutely massive. One of things I also like is I've got a dishwasher over here and then this faucet is a special faucet. If I have dirty hands or let's say I'm washing dishes, I can easily turn it on and off with just any touch to the faucet. This sink over here has the same exact faucet, what it also has is a hot and cold water spigot. So what I can do is actually make my morning tea and it comes out with boiling hot water. [00:03:21] Some extra consideration that we had when designing the sink base is we actually put a fully functional drawer below. A lot of people would have a dummy drawer here, one that is not operable. In this case I was able to actually use the same amount of space and get more functionality. We did the same thing on the island here too, so we've got that sink base, notice the soft close on that drawer as well as on the doors here too. Speaking of this island, need to see how much functional storage there is in here, both of these they look like decorative end panels don't they, but I can have spices here. I can also remove this the shelf here and I can actually have a bunch of trays. Also over here, by these island stools, I figured this would be a perfect place to keep a bunch of stuff that I wouldn't access much. [00:04:10] And then over here is the microwave drawer. I get a lot of questions about this. All you do is press a button and it opens up it makes it really easy to take a heavy dish and set it in there or to of course lift out the hot dish. I like entertaining and having people over for holidays and such, and usually I'll need the crockpot, by the way that was an extra deep drawer there really easy to store this away. Now when I have this all set up it's going to be important to keep it running, that's why it's nice to actually have an outlet right in the island and I also have plenty of room here for setting out other dishes. Now even if I'm not entertaining, how nice for me to be able to plug in my blender, which I use daily right here and I have cords dangling over the countertop. [00:04:56] Now the other appliance I get a lot of questions about is this professional series sub-zero refrigerator. What I really liked about it is that it is extra tall. And I wanted that height throughout the whole kitchen. We have 4 big windows up here the ceiling gets as tall as 22 feet. We also have this incredible range hood over here. This range hood is something special that Golden Eagle does. It takes actually a lot of extra engineering to make sure we're supporting all this weight because here is a 4 by a 5 hewn band board up here and actually matches the rest of the wood styling throughout the house and that stone up there is the same stone that you see on the fireplace. [00:05:33] But before we head over there, I just want to point out the extra height we did in these cabinets. We actually have glass up there, it has a rough industrial finish. I think those industrial elements throughout the kitchen as well as the whole home tie in really well and you'll easily see them in the light fixtures. So actually, the glass finish on this light fixture is very similar to the glass finish in the cabinetry itself. [00:05:58] This huge fireplace is just the center of the home. I really like this stone style, I think it gives me a rugged timber theme but what I really like the most is this incredible wood burning fireplace, it's 45 inches wide here. This thing can heat the entire home. It'll heat up to 2300 square feet and it is something that will last me a lifetime, that's for sure. I really like the little details here in the round radius on the hearth here as well as the stone up here on the mantle looked really neat. [00:06:34] This is where I'm spending most of my time so I want to make sure felt comfortable and a big part of feeling comfortable is having a really nice lighting. This here accents up the ceiling highlighting those incredible timber trusses. As you've probably figured out by now I really get into lighting and the way of space feels. So for me to just be able to sit down have my fireplace right there, T.V. ahead of me, incredible view, really nice ambient lighting but there's still a lot more to show you so let's head on over to the master suite. As we enter the master suite you can see there's a big 8-foot-tall door that's actually a common theme throughout this whole center section because the walls are 10 feet tall that not only allows for us to have that 12-inch band board but also really massive trim around the doors. [00:07:22] I love the way the master suite turned out and one of my favorite things is the incredible view, just look at all these windows. These craftsman style grids have wood on the interior and a maintenance free aluminum cladding on the exterior, you'll notice that these windows seem extra tall. Well that's because these are 9-foot walls in here that allowed us to go with taller windows. I also have a sloped soffit line which allowed me to go taller with the header heights in here. What that really allows for is I can be laying in bed and easily see the stars at night, that happens pretty often. But I also have so much natural light coming in through these windows it just peers off this vaulted ceiling and you can see how that loft space is so well lit. Now remember, this was originally just going to be a tall wall going up there and then I saw a great opportunity to open this area up. I really like how it turned out. [00:08:11] In fact, I'm going to sneak up there right away and just show you how neat it looks. It's just incredible how this all turned out. You can see the four beams that are following the ceiling tying into the big bridge beam up here. This also is a custom railing made out of rebar, there's a big space up here I could do a lot of things, but I think I'll primarily use it as a quiet reading spot. [00:08:37] We're actually coming down into the master closet area and there is a really neat closet organizer system in here. You'll notice this cabinetry here it actually matches what we see in the master bath. This here is a rustic hickory. I think it looks absolutely beautiful, look at the way this solid surface top just angles across. We've got really nice integrated bowls here and this solid surface is very easy to clean, especially with these wall mounted faucets. [00:09:08] What always catches my attention when I walk in is these industrial looking lights. I really like how they reflect in this large mirror. But you'll notice that I kind of have a unique trim around here. I actually asked Golden Eagle to send me out some extra material and I made sure to stain at this dark finish. That way it not not only matched my faucets, but it gave it more of the bold accent that I was looking for. [00:09:30] This walk in the shower turned out really well. I really like it there is basically nothing to step over when you get in here it's up perfect transition from the rest of the floor. I also really like this glass wall it goes all the way from floor to ceiling it allows me to really appreciate the rest of the tile in here. You'll notice that there are two rain heads in here and they each have their own temperature controls. So not only will each person have their own temperature setting but there's also a niche for each person to keep their own stuff in there. [00:10:00] This window is waterproof and has obscured glass in here for privacy. I can't imagine if I wouldn't have had this waterproof window in here. This is something that our designed team absolutely encourage because this space allows for the natural light to not only flow into the shower highlighting all this beautiful tile but it also goes with this glass wall and closed off the rest of the master bath. If you have the space, I highly recommend a powder room. Not only do you get your own private toilet but also a nice sink area that we can wash your hands before you exit. By the way, I just love the space saving features of these pocket doors. [00:10:40] I really like having this door between the walk-in closet and the laundry. It is just incredibly convenient, it's easy for me to pop in and out. Another really nice thing is that someone still sleeping in the master suite you can kind of get out of this area without disturbing anyone. Look at all this countertop area makes it really nice for folding. I even have a insert on the countertop here. Now of course you can add your regular laundry tub for soaking items in here and when you're doing that you can leave just over the top and still be folding stuff. [00:11:10] A home like this lends itself to unique spaces, there's actually a plant shelf right above us. Some people might call that mini loft, but basically I can see having Christmas decorations up there. This is that large header that I had mentioned it's right on the other side of the foyer area which has the barn doors. What's nice about these double barn doors are when you close them both together it actually gives you privacy in this laundry area. I really like the functional use of that and it also looks really good when it's not in use, by the way all these cabinets up here, really nice for a laundry room area. [00:11:44] Now right when you walk in outside of the garage, there's this mud room area. 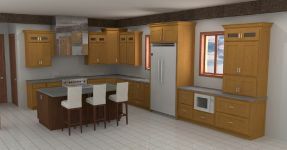 Actually have custom cabinetry here designed through Golden Eagle. We've got hooks on here and then for the stuff that's not necessarily in season, that can be stored in here and this has closet organizer's like what you saw in the master suite. It was important to me to have a space dedicated to the dogs, that way they could easily come and go as they wish through the doggie door. I also have cabinetry in here, it allows for me to store their toys and their food is here too. This whole space is tiled off makes for a really nice continuation from the dog room into the mud room and then into the laundry. [00:12:18] All of this is connected right into the garage. Really I'm happy with how big it feels in here. Now this is a heated garage and it's something that I can actually control through an app on my phone. So I control the in floor heat. It's all connected to a boiler and that's why you see a drain here, right in the middle. We installed a water source directly in the garage, this will allow me to wash off my truck in the middle of winter. You'll also notice that we have drywall in the wall here. The drywall as well as the timbers throughout the whole garage just made a lot of sense being that this is a heated space, I need it insulated anyway. The garage doors are super insulated as well as the walls and the ceiling even this space out here is great for entertaining. [00:13:02] Now you're probably wondering where do I keep all of my stuff? Well my garage it is probably going to stay is as organized as you see it right now because I have the flexibility of utilizing a storage truss right above me here. This room up here is actually just as large as the garage below. The storage truss is fantastic for things that I wouldn't access regularly like Christmas decorations. Now the staircase from the garage into the basement this is incredibly convenient especially because it's extra wide and extra tall. I can move large items down or up the stairs easily and there's also a special feature on that dead bolt on there on that door: I can actually unlock it remotely through my smart phone. It's incredibly convenient if I ever have a service person coming over to visit I can give them remote access to that space without them having full access to the rest of the house. In fact I have those same deadbolts on all of my exterior doors. What's nice about that is I can be out of town, I can be away from home and if I am unsure whether I locked the door or not, I can just check on my phone and then I could lock it remotely. [00:14:14] The same thing is applicable with the garage doors too, so I could open or close those through my phone. Something you'll see here is there is no step from the garage into the house, it's incredibly convenient whether you're bringing groceries or if you have someone over who's in a wheelchair but for me I think of my grandparents. They come to visit me pretty regularly and it's nice for them to not have to think about you know the difficulty of getting upstairs. So this is really a great decision I'm glad I did it. Speaking of my grandparents, you probably remember when I was showing them my floorplan my grandpa had suggested to me that it was important to consider well what if you've been out grocery shopping and you want to get home to go to the bathroom and gotta come inside on your groceries and have a bathroom nearby, you don't want to run across the house. So this was more of my grandpa's vision. And he's been doing this his whole life, all of us have, it was really need to be able to take his advice and implement that into my dream home. [00:15:14] You already saw the stair from the garage into the basement. Now this here is the primary one, this is the one that separates the kitchen and the great room area. It's extra tall, 42 inches tall here a double top rail, which is more of a craftsman style. And I really like the channel that goes around these newel posts here just looks extra special you'll even notice of these are actually timber stairs and they have wooden pegs that connect into the stringers below them. Even look at this railing, this metal piping it just ties into the rest of the industrial look throughout the house, this hewn finish used throughout the whole home it looks really rough and rugged, more of a reclaimed nature. What I like about it is that it's actually smooth by the time it gets sanded down and the sealer goes on there it's so smooth that not even a microfiber towel will caught on it. And it's like that throughout the whole home whether you're looking at these timbers or even the trim here. Now we're on the other side of the house and this is the guest bathroom. I just love the way the Herringbone turned out in here. This tile pattern looks absolutely gorgeous I think it's a great for a smaller space like this kind of draws the eye and it lengthens out the room. In the master bathroom we had that window in the shower area I did the same thing in here it just makes the space feel a lot larger. I really like the way it looks too and having this barn door style glass door it allows for that light to naturally come through. [00:16:44] Now for the observant person, what I really appreciate about this bathroom are the rafters on the ceiling. Those are actually structural and they support the kids lofts in the bedrooms. Let's go over there and take a look at those. This up here are those beams that continued through and it's supporting that kid's loft up there. It's really neat, we've got this custom latter going up to here. It's really neat being up here this loft area is meant to be for kids that's why there is a door actually connecting to the other side. Now both doors would need to be unlocked of course for someone to pass through but I can just see this be an extra play space or somewhere where someone could have a sleep over and one of their friends could actually stay up here. [00:17:29] Now it's also built with the same integrity as we had in the master area. The railing is powder coated and custom made to be strong and fit perfectly to the space. It's actually mounted directly to the floor system. I also of course appreciate these custom timbers with these fluted ends down here, beautiful looks decorative. And then this here is 2 by 6 decking. This decking on top here that I'm sitting on is actually the ceiling finish in the bathroom below. Just like all the other closets in the house, the guest bedrooms have cabinetry inside of them. What I like about this is it keeps everything in one place. Also I really appreciate that I don't have to go buy dressers or make the bedroom any larger to accommodate those dressers. [00:18:14] Before we head outside I'd like to touch on a few of the primary finishes in the house. The drywall, it is the heavy skip trowel. I think that gives more of an Old World style and you see a lot of that in my tile selection as well. The flooring, that's a rustic hickory and on the ceiling we have more of a reclaimed pine looks absolutely gorgeous and I think it accents those timbers really well. [00:18:38] Let's head on outside, there's a lot to show you out there and I think it's just as good as the inside. And then outside I want to feel like an extension of the inside of the home. That's why I've continued with the craftsman motif. You can see that these light fixtures here, there are also a lot of craftsman elements on the outside I'd like to show you. The 1st thing that I usually notice is the hand hewn finish on the outside here. Now this is a big 12 inch vertical corner, I looks really strong and masculine, it looks like it actually holds up the whole house. And then below that I've extended the cultured stone around the whole perimeter of the house it is actually the same height throughout. So it's not only on the foundation but I also raised it up an extra foot above the decking here. [00:19:27] Now this here, this here this is more of a hand-hewn finish but it's a very special product. This is called Our 12-inch double hewn and it's something created t Golden eagle, my dad actually came up with it. What it has is this double round on the top and bottom and then a flat on the face. It's also a unique characteristic that we went with 10 inch wide trim on the sides of the windows and 12 inches on the top. [00:19:49] Remember when I was in the master bedroom and I pointed out that I can have larger windows because of my slope soffit that I'm using? Well, this is that slope soffit right here and you can see that allowed the header heights to go up taller than usual. In fact all the roof lines are very unique we went out from 3 feet to 4 feet at it's highest point up here in the gable. I really like the look of the cedar sawn shakes up in the gable it contrasts with the log that you see on this walls as well. The stone that you see on the fireplace chase here. When you look at all of my exterior doors my soffit, and my fascia, you'll see that it also matches the same color as this maintenance free railing that we have here. [00:20:26] It was important to me to create an outdoor space that could accommodate having a lot of people over. I can see where I can have a morning breakfast here or just have food sitting up there while I have guests over. The Parmeters are really into having camp fires so it was important me to be able to accommodate 10 to 15 people at one time that's why I have these nice Adirondack chairs here. You can even see I was able to incorporate the landscaping and the boulders into the ceiling around the fireplace area too. In fact we actually brought in 80 boulders to the jobsite here and that's how I was able to bring in more of the mountain setting to the Wisconsin North Woods. [00:21:05] This was a very flat piece of property but as you can see I was able to raise the house out of the ground which allowed for me to have a lot of beautiful stone on the foundation and tier the boulders to incorporate some very unique landscaping. Speaking of boulders I just need to show you what we did with the dog door here, it looks really needs and the dog comes up 3 boulders to get into the dog room. A really fun elements in the house. [00:21:29] Another neat thing is what we did on the back side of the garage here. This certainly does not look like an ordinary garage it is full of incredible detail. We have a metal roof up there with 2 by 6 decking below it and it's all supported by these rafters with beautiful fluted ends on them. I really like having the windows here it's a continuation of the home and then the accent that you see up there is 1 by 12 board-on-board. It has the hand hewn finish, I think it offers really good contrast to the horizontal log below. [00:22:00] I'll be finishing off the basement in the future and I want to maintain the possibility of adding bedrooms down here. That's why I decided to put in these large windows they are the same exact size as the windows that you see up there and all of these have egress window wells. What's really nice about that is they let in a lot of natural light and it's easy to get in and out of them. This wall is just absolutely beautiful. I really like I broke it up with stone logs and cedar singles. And then to top it all off I've got that beautiful queen arc truss up there. [00:22:32] And we also have that same truss above the garage here. We extended the rake over to be 4 feet deep that way it protects the truss and also offers more of an accent. You can see this beautiful metal roof area it's supported by these rafters again just like what we saw on the other side of the garage. You know I really appreciate all that detail and I just had to do it on the main feature of the home which is the covered porch. [00:22:55] This covered porch actually extends the whole length of the front of the house here, we've got really beefy spindles here, the double top rail is really nice double arch brackets, but not only arched on the inside but also this side too. We've got the same rafter supporting this whole roof to some it's completely structural and I really like that I'm able to walk up to my front door, admire this double hewn half log and then also the beautiful front door. It's 8 feet tall, 3 and a half feet wide this is forged metal hardware on this even the doorbell, it's an incredible feature, it just looks absolutely beautiful. Something as simple and small as that those are the little decisions that you're making when you're design your own dream home. [00:23:42] It's this kind of attention to detail that really makes it a Golden Eagle Log and Timber home. They have thought of everything. And they're one stop shopping experience made it really easy for me to pick out the home of my dreams. This is certainly something I'd recommend to anyone. I hope you learned a lot following along on the construction. If you have any questions about the floor plan or want to see what it looks like there is a link in the description below. This was a terrific experience I'd certainly do it again and thanks for joining me and following along.